Wondering about whale watching in Long Beach? Whale watching is a popular outing that is fun for the whole family.Whale watching in Long Beach is typically done from October through July, when the whales migrate between Alaska and Mexico. 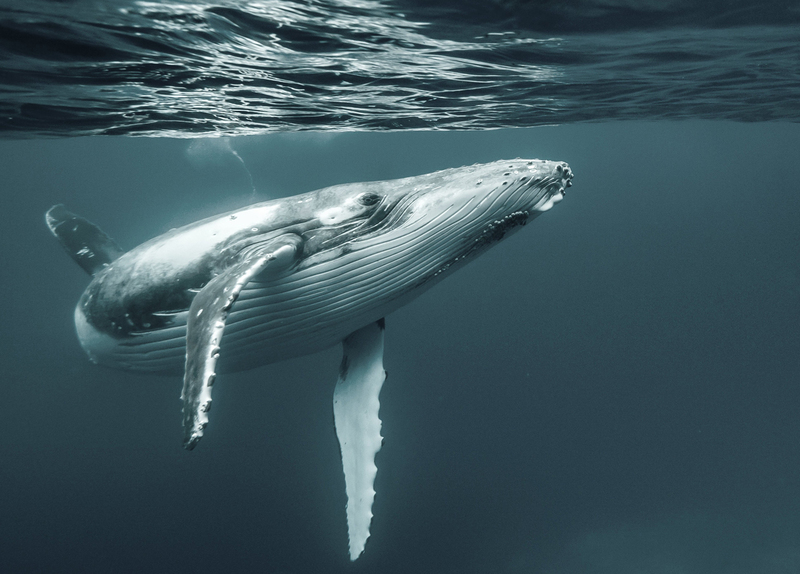 Their migration pattern takes them through Southern California, making Long Beach the perfect spot to go spot whales. When whale watching in Long Beach, you’ll see Pacific Grey Whales, Fin Whales, Humpback Whales, Orcas, and even Blue Whales! During the late summer months, the whale watching cruises become sea-life cruises, and search out local dolphins, seals, and sea lions. The most popular whale watching in Long Beach is done by Harbor Breeze Cruises. They have been doing whale watching in Long Beach for close to 20 years. They have 7 boats, including their newest, a state of the art 50′ catamaran named the Triumph. They run several 3 hour tours every day out of Docks 2, 3, and 7 in Rainbow Harbor. Tickets can be purchased ahead of time on their website, www.2seewhales.com, or at their ticket booth at Dock 2. Parking is available for a fee at the Aquarium of the Pacific parking structure at 99 Aquarium Way, Long Beach CA 90802. They are also located a short walk from the AquaBus and AquaLink on Dock 4. Harbor Breeze’s boats are staffed by United States Coast Guard certified captains, and several experienced deckhands, and include a snack bar and a limited bar. Kiosks near their docks sell anything you may have forgotten, including motion sickness pills, beanies, sunglasses, and hats. Whale watching is perfect for families with children, as the seas are generally calm and the vessels are large enough that seasickness is not usually a problem. There are also plenty of child-sized life jackets on each vessel. While sightings cannot be guaranteed, during different times of the year Gray Whales, Fin Whales, and Humpback whales can be seen along side dolphins, seal lions, and other marine animals in and around Long Beach, the Port of Long Beach, and Catalina Island. Harbor Breeze also partners with the Aquarium of the Pacific to include one of their educators on some cruises. Harbor Breeze Cruises also offers shorter 45 minute harbor cruises around the Port of Long Beach and the surrounding areas. These use the same boats as the whale watching cruises, and use the same docks. For information you can call (562) 983-6884. The Tall Ship American Pride also offers whale watching in Long Beach. Located on Dock 3, the 130′ three masted schooner is a recreation of a 19th tall ship, and offers whale watching on selected Saturdays, and a whale watching brunch on Sundays. During the week, the ship is available for school sponsored whale watching. Advanced reservations are required, and tickets cannot be purchased at the dock. Reservations can be made by going to their website or by calling (714) 970-8800. Capt. Chuck from Island Trader Charters also does whale watching. he has a 38′ power boat located in Rainbow Marina, near Shoreline Village. He specializes in small groups (maximum of 6), by appointment only. He can be reached at (714) 625-6074.